The restaurant An Viên at the end of the Trần Đại Nghĩa street, near its intersection with the Đồng Tâm street, is quite famous among the student populace for its exceptional recipe of salty stir-fried chicken feet and wings. 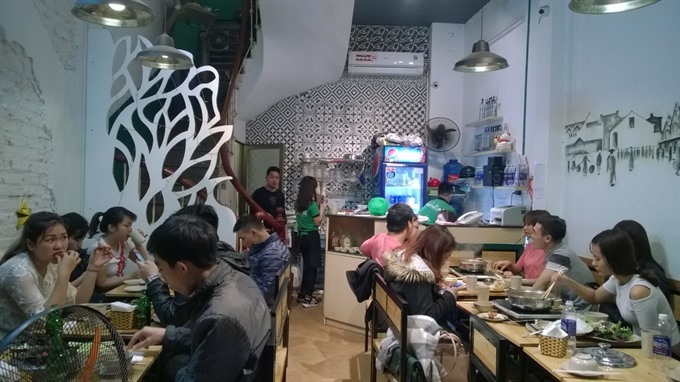 Trần Đại Nghĩa Street’s proximity to two big universities in the capital city, the University of Sciences & Technology and the National University of Economics, has seen it host a variety of eateries catering to a large number of students. Different kinds of food, snacks and dining styles are on offer, and any first-time visitor will feel she/he has entered a culinary world that never goes to sleep. One of the dishes that I have taken a fancy to on this street is chicken wings and feet, served in several ways, grilled on skewers, fried with chilly and lemongrass, and salty stir-fried chicken. The fried chicken served by the An Viên restaurant at the end of Trần Đại Nghĩa Street near its intersection with Đồng Tâm Street, is quite famous among the student population, most of whom will swear that its recipe for salty stir-fried chicken feet and wings are exceptional. When my friend and I stepped into the restaurant recently, we were initially a bit overwhelmed by the gregarious, somewhat bit rowdy vibe generated by the students eating there. They were savoring the food and talking quite freely. Soon, we were focused on the food, and the noise ceased to bother us. The salty stir-fried chicken was noticeably the top choice; it was present on every table. We did not hesitate to order the same. Unlike many other eateries who take orders per dish of 5-10 pieces, An Viên will even serve you one chicken foot (VNĐ10,000). We expected the dish to be tasty, given its popularity, but its deliciousness was still a surprise. The chicken feet were neither too fat nor too small, so the texture was spot on, not too oily or dry. They had a crispy, golden brown coating. The salty flakes were interestingly pinkish yellow in colour. The flesh was firm and tender as I bit into one. The bone stayed intact and hard, showing that only fresh chicken were being used. The low-quality imports used by many eateries have brittle bones. Despite being a fried dish, it was neither too oily nor too dry. It had been marinated well with peppers and lemongrass. “The salty coating, which uses our secret recipe with the finest herbs and spices, makes our chicken dish the favourite of so many customers," said the manager of the restaurant. Young crowd: Most customers of An Viên Restaurant are students from University of Sciences & Technology and National University of Economics. Looking closely, I found the salty coating quite similar to pulled seafood floss that is fried to a crisp. It was a great sensation, the salt coating melting right away in the mouth, blending with the chicken feet’s flavours. Although the chicken feet dish was a great starter, we were not as impressed with the salty stir-fried chicken wings. Both have been my favourite dishes for long, but the chicken wings here were not really exceptional, maybe because they were quite thick, and had not been marinated for long enough. It was not as thoroughly flavored as the chicken feet even though the same salt spice recipe was used. Many of the restaurant’s customers, mostly students who are heavy eaters, tend to order many other dishes on the a la carte menu before the main course, which is a steamboat. However, my friend and I decided to go straight to the kimchi hotpot, our favourite. The restaurant also takes orders for a single hotpot, and we ordered a small-sized one. 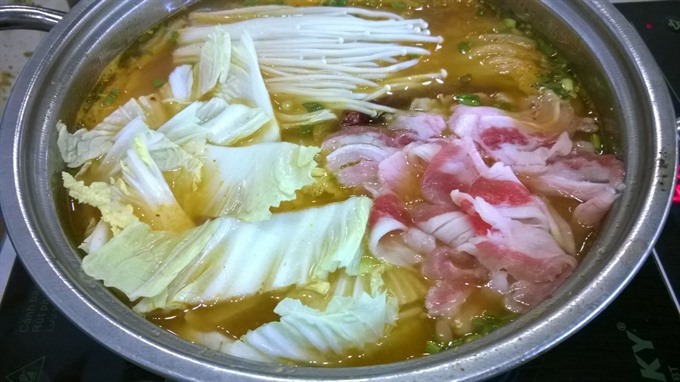 This is a simple hotpot with a large plate of vegetables, noodles and American beef. While it was not visually impressive, it tasted good. All the sweet, sour, salty, and sweet flavours of a typical kimchi pickle or soup were there. At VND159,000 for a two-person kimchi hotpot, the price was certainly reasonable. I just wish it had more vegetables, instead of just napa cabbage. The variety would make a big difference. However, the restaurant also offers many side dishes including beef tendon, shrimp and squid that customers can order to add more flavour to their hotpot. We ordered just a little bit more beef. A 100-150 grame side of beef came at VND50,000, not too expensive for low-income customers. In general, An Viên is a good choice for anyone looking for a meal at an average price, in a not too fancy establishment. However, it is a must-go destination for chicken feet and wing lovers like me. The salty stir-fried chicken feet is definitely the dish I would recommend to anyone coming here. It is just only the restaurant’s signature dish but also one that offers awesome value for money. 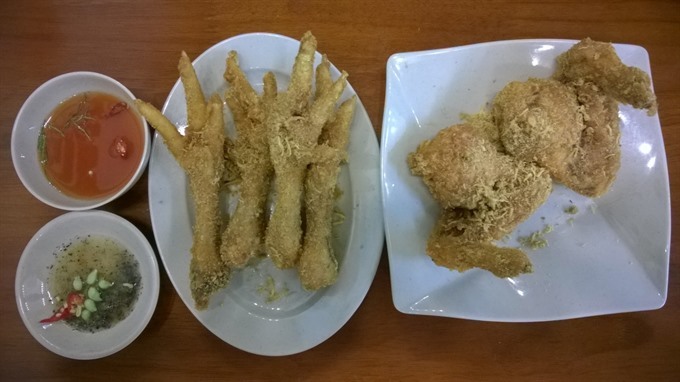 Feet first: The salty fried chicken feet, with its crispy golden brown coating, is better than the chicken wings that also uses the same spices.